Spline-based approaches to nonparametric and semiparametric regression, as well as to regression of scalar outcomes on functional predictors, entail choosing a parameter controlling the extent to which roughness of the fitted function is penalized. 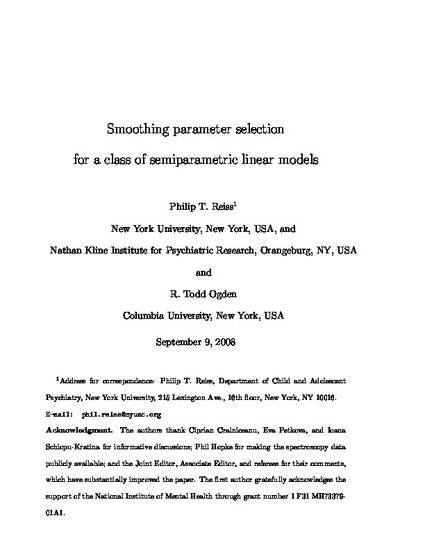 In this paper we demonstrate that the equations determining two popular methods for smoothing parameter selection, generalized cross-validation and restricted maximum likelihood, share a similar form that allows us to prove several results common to both, and to derive a condition under which they yield identical values. These ideas are illustrated by application of functional principal component regression, a method for regressing scalars on functions, to two chemometric data sets.